What is The Successful Wealth Approach? The Successful Wealth Approach is designed to help you create a strategy to achieving your lifetime financial goals. Hello my name is David Edey and welcome to my website. You will find many articles on the various personal finance issues that are of interest to many people today. Whether it is thought of planning for retirement or clarifying what is important to attaining your goals, you are bound to find something on this website to help you. If you don't find what you are looking for or have questions please fill out contact form or give me a phone call. My step by step process is about you achieving your unique goals. I think the approach I take will help you because we start by you developing your own Wealth Vision. For example you might envision what your retirement might be like, or for your business or looking after your family after you die; or a vision which combines all of these things. This means you have a plan of what you need to do. 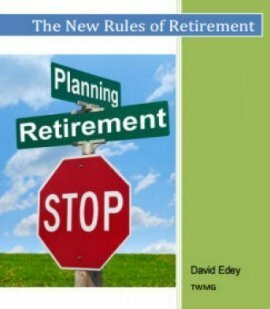 You will not have to worry about if you will run out of money in retirement. Know that your business will provide you with an income when you are ready to sell it. You will not have to worry about if your family will suffer if you are not around to support them financially. The process helps you develop this kind of strong,clear and personal outlook and then develop action steps to achieve them. The Successful Wealth Approach has 3 distinct steps. 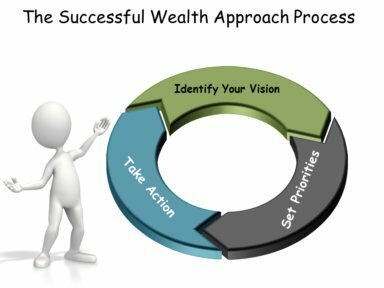 Participants in the Wealth Program work through each of these steps during regular Wealth & Action sessions with me. So if you believe that people do not plan to fail, they just fail to plan then contact me. Or email me, I look forward to hearing from you. The emphasis of your Successful Wealth Vision is what makes the process powerful and different. Most financial services companies simply offer you just financial products such as stocks, mutual funds and insurance. But they don't help you figure out why you want to grow your assets or increase your investment income. You will know how much money you will need based on how you want to live your life in the future. You will have a step by step plan to follow. You will not be confused about what you need to do next with your money. And I have learned that people with a strong vision usually achieve much greater financial success in their life and to me, that is what is most important.